Crude oil tracking ETFs allow you to trade oil with your stock brokerage account. The commodities futures exchanges are the traditional venues for crude oil trading. Futures trading requires a different account with a different type of broker than your stock trading account. However, the development of commodity tracking exchange traded funds, or ETFs, allows you to trade the value of oil using a regular stock brokerage account. To start trading oil, you need the tools -- the oil-related ETFs -- and a strategy to pick the direction of the price changes in crude. Put together your toolbox of oil ETFs, including one fund in each of four categories: an ETF that directly mirrors the price of crude oil, a leveraged ETF that changes value at two or three times the percentage change in crude, an inverse ETF that moves in the opposite direction as crude oil and a leveraged, inverse crude oil ETF. Leveraged ETFs will have names containing words such as "Ultra," "Double," "2X" or "3X." Inverse ETFs can be spotted by the words "Short" or "Inverse" in the name. There are at least two ETFs that fit the criteria of each of the four categories. 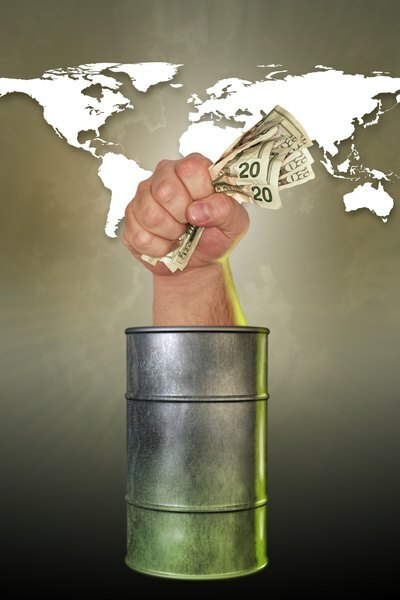 Develop the strategy or indicators that you will use to predict the price of oil. Technical indicators analyze price chart action to show you patterns in the price of oil. Fundamental indicators include factors such as supply, demand, production levels and economic conditions that might affect the price of oil. The time frame of your analysis might be as short as day-trading the price of oil out to week and month-long price trends. Trade the leveraged ETFs from your toolbox to profit from expected short-term -- day-trading out to a few days -- changes in the price of oil. The regular, leveraged fund is bought if you expect oil to go up, and the leveraged, inverse fund is purchased to profit from a drop in the price of oil. Trade with the un-leveraged price tracking and inverse oil ETFs if you want to take a longer-term position on the price of oil. Using un-leveraged ETFs for the longer term will keep you from being whipsawed by leverage from the daily price swings in oil. If you plan to trade actively, pick ETFs with high trading volumes so your orders are quickly filled at good prices. All of the different crude oil ETFs use futures contracts to meet the objectives of a specific fund. Spend some time learning the individual fund objectives to understand how the fund is designed to function. If you trade using a margin brokerage account, review the margin limits for inverse and leveraged ETFs. The Securities and Exchange Commission has very different margin rules for these types of funds compared to stocks. The Financial Industry Regulatory Authority, or FINRA, has issued an alert to let investors know about the extra risks involved with trading leveraged and inverse ETFs. FINRA has said leveraged funds are not appropriate choices as long-term investments or trading positions.